It's taken me a little longer than expected, but I've finally put together Part 1 of this Hottest 100 segment. I've tried at least 1 beer from each decade (yes, it's correct - it's not just used for years.) and have written short summations for you below. Assuming things go to plan, ie. I can find all the beers in time, I intend to complete this challenge in 10 posts. #7 - 4 Pines Pale I don't know if the distribution of this beer has been improved, but it's a greatly improved beer from what I knew it before last year. It's a lovely Pale Ale, when fresh, which has a nice biscuity malt base with restrained bitterness and grapefruit and pine hop flavours. #13 - Two Birds Taco Very few GABS beers survive the test of time. Sure the odd one is bottled, but rarely do the go on to become permanent offerings from the brewery that creates them. The original GABS beer from Two Birds bucks that trend and is still their most popular beer 3 and a half years on. It's a wonderful beer which evokes the flavours of Mexican cuisine, with lime and coriander dominating with chilli and corn in the background. It's just been released in cans and is a summer favourite of mine. #28 - James Squire The Chancer I was concerned that this beer was going to be horribly sweet. I needn't have been worried! James Squire is the main craft arm of Australian brewing giants Lion (who are now owned by Kirin). If this beer is any indication they're doing a reasonable job of producing beers that will hopefully convert more drinkers to craft beer. Contrary to popular opinion in the craft community; you could do far worse if you're at a pub than try this beer. #38 - Wolf of the Willows XPA This beer is so underrated; it's bordering on criminal! I've re-discovered this beer in the last couple of months and now I always have some on hand. It's a wonderfully balanced beer with lovely biscuity malts laying the foundations for the passionfruit and citrus hop characteristics to shine through. I'm going to make sure I have at least one o these a month in 2017! I'm seriously considering voting for this beer in this years Hottest 100. #45 - Hawkers IPA Hawkers IPA took out 45th spot in the countdown, This is one that I forgot to post on Instagram for a few months, but found when I had to clear photo's off my phone. There's nice bitterness to this IPA, with pineapple, passionfruit and citrus all prominent. This IPA is a really nice readily available option and, like all their beers, I wouldn't be surprised to see this higher in the next countdown. #56 - Kosciuszko Pale Ale I didn't know what to expect from the Kosciuszko Pale Ale. It was started by the legendary Chuck Hahn in 2009 and like all his previous ventures has now been bought by Lion. Again, putting aspersions aside and looking at the beer objectively, I was reasonably happy with it. The malt body is predominantly bready and the hops provide nice notes of grapefruit and moderate bitterness for the style. #62 - Newstead Two to the Valley This Queensland brewery has got a pretty good reputation, although very few of their bottled offerings make it our way down south. I'm not sure where I picked this up, but it's a nice tasting IPA. The malts provide caramel and biscuit notes, while the hops are mostly citrusy and quite bitter. 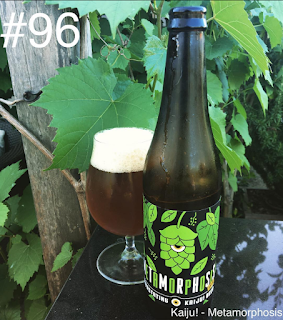 It's one of the more balanced IPA's that I've come across in Australia, #62 is probably a little low for this beer. #78 - 4 Pines ESB It's taken me years, but I think I finally understand ESB's now! This beer is lovely with plenty of malt and dark fruit flavours being balanced out by impressive, distinctly English, earthy hop bitterness. I don't think I'll ever be a person who would vote for an ESB in their Hottest 100 votes, but I now at least understand why some other people would. #82 - Batch West Coast IPA I stumbled across this beer at my work local craft beer bar; Dr Morse, one afternoon after work. It's a really impressive IPA and one that would do far better in the countdown with wider distribution - this is the first time I've seen this outside of Sydney. The body is relatively light and predominantly biscuity, while the hops provide assertive resinous pine and citrus bitterness. #96 - Kaiju Metamorphosis Kaiju suffered the two biggest falls in last years Hottest 100 countdown from the previous year, with this particular beer falling all the way from #29! This is not the typical sort of IPA you'd find in Australia; with masses of malt at times overwhelming the hops. It's got chewy caramel and biscuity malts as well as grassy and floral hop characteristics. It's a beer that seems to change from batch to batch, with the one I tried before this having an almost roasty quality to it.